Raina Telgemeier’s critically acclaimed graphic novel Drama has survived another attempt to ban it, this time in Ottawa Catholic Elementary Schools. 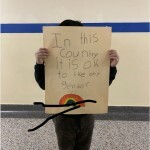 CBC News reported on January 15 that they were shown emails ordering librarians at all Ottawa Catholic School Board elementary schools to remove the best-selling graphic novel after parents complained about the LGBTQ content in Drama. 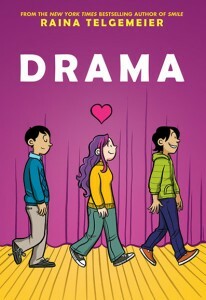 Since its publication in 2012, Raina Telgemeier’s aptly-titled graphic novel about navigating the drama of middle school as told in the context of a school play has received accolades and praise from School Library Journal all the way to The New York Times. Nominated for the Harvey Award and a Stonewall Honor Book, readers have embraced Drama for its fresh and fun tale of one seventh grade girl’s adventures navigating middle school life and love. It has also remained consistently one of the most frequently challenged and banned books in America. The Ottawa Catholic School Board voted to remove all the copies in the elementary schools, but argued that it wasn’t banning it because students could still access it in middle and high schools, which they felt were more age appropriate – pointing to Scholastic’s age guide saying it was for student’s between 10 and 14. But every student is different, and age recommendations are just guideline to start, not laws restricting access to books. Yes, DRAMA got banned in Ottawa Catholic elementary schools. And all this time we thought Canada was our most progressive sibling! I’m sad for the kids who need this book but can’t access it. 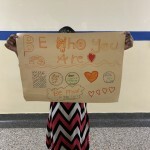 There was an outpouring of support from people all over the internet for Drama as well as the kids in Ottawa Catholic elementary schools who couldn’t access it. People questioned why a kiss at the end of a fairy tale like Sleeping Beauty is considered age appropriate for young readers, but this kiss wasn’t? Isn’t it shaming LGBTQIA children and children with LGBTQIA parents that a kiss between two boys is something so outside of the norm that caution must be used when approaching who can check out books that feature it? 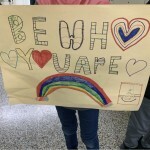 A group of 5th and 6th graders in Ottawa known on their blog as the Supreme Squad talked about the book ban the next morning in class. 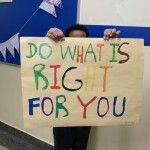 Through their discussion they decided that banning the book sent the wrong message and that they wanted to send better messages, so they made signs to show their support to the kids who feel isolated by the banning of a text that offers diverse positive reflections. We really wanted to reach out to students who by hearing this news, feel alone, sad, and like they are bad. 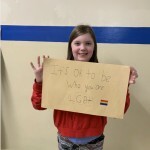 “You aren’t alone,” said Kaylynn. “Don’t feel sad, we support you.” said Daniel. 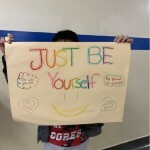 “Just be yourself,” says Haileigh. This made me tear up. 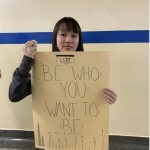 Students made posters to let LGBTQ kids know they’re loved. Thank you. Certainly, Telgemeier is not alone in having a visceral reaction to these young children so clearly grasping not just the ban on the book, but what that ban says to other kids who may see themselves its characters. 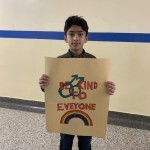 These kids were able to get right to the heart of the matter in a touching way while displaying an empathy that the school board couldn’t grasp. This is amazing news, not just because the ban was lifted, or because it demonstrates once again that people have a voice and when they use it, change can happen. But also because the Ottawa Public Library has a super long waitlist for Raina Telgemeier’s Drama, and now kids can access it through their school libraries instead. Check out CBLDF’s Case Study on Drama to review some of the past instances of censorship this beloved graphic novel has faced. Help support CBLDF’s important First Amendment work in 2019 by visiting the Rewards Zone, making a donation, or becoming a member of CBLDF!